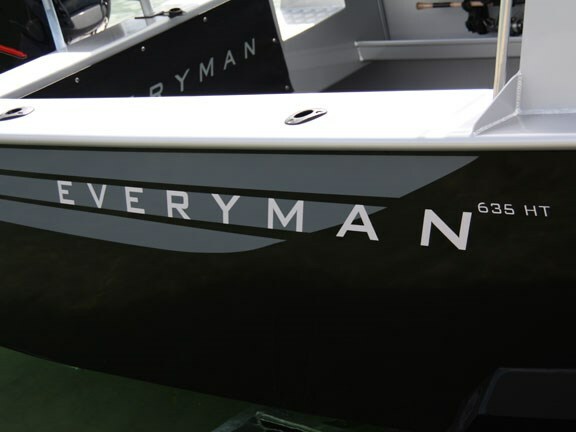 Everyman is a new name on the alloy boat scene, although boats from its factory have been around for longer than many realise. Boatbuilder Nigel Langdale learned his trade at Ramco many years ago and has been building production boats for Marco and Sportscraft for a number of years. 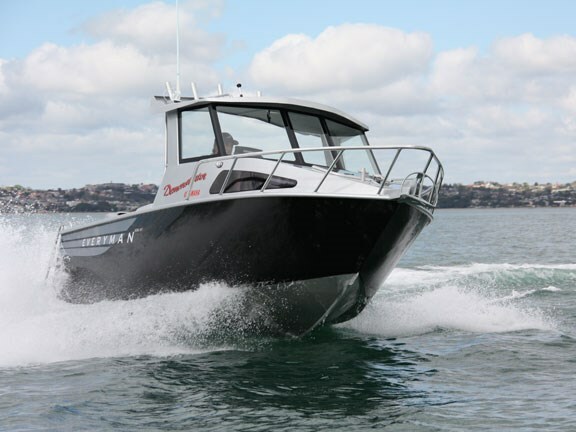 He has also produced a number of boats under the TA (Te Awamutu) Boatshed name, as well as supplied a range of boats under contract to Family Boats in Auckland. Russell Spiers, a cousin of Langdale, had watched the progress over the years and saw enormous potential in the design and workmanship of the boats being produced. He came on board to develop a brand and build a dealer network in the current softening market. The result has been the launch of "Everyman Boats", with the coming together of parties who likewise subscribe to the notion that boats don’t have to have a radical deep-V to perform well. Built at Langdale’s premises in Hamilton, this is Everyman’s second hardtop version. The first was sold to an avid fisherman who fishes predominantly out of the notorious Kawhia harbour on the west coast. The 635 hull is a proven design, having been released in an open cabin design last year. Further models (685 HT and a 725 Wheelhouse) are planned for release soon. We first viewed the boat at the Waikato Boat, Fishing & Leisure Show held at Mystery Creek outside Hamilton. Despite being tucked away near the food stalls, the boat received a lot of interest and there was a constant stream of people coming to have a closer look. Spiers reports that one firm order was placed at the show, with several other interested parties also booking on-the-water tests. The reason for that interest was apparent to even the casual observer – the standard of finish. Clearly Langdale, who builds every boat himself with a small team of assistants, is a craftsman of the highest order. From the near-perfect welds to the finely polished seams, the sheer sides of the hull and the mirror-smooth paint work, every aspect of this boat shows attention to detail that is missing in most mass-produced boats. The basic hull is 5.85m in length, with a LOA of 6.35m. The hull sides are unmarked by any lines or corrugations and provide a freeboard that is unmatched in most boats of this length. 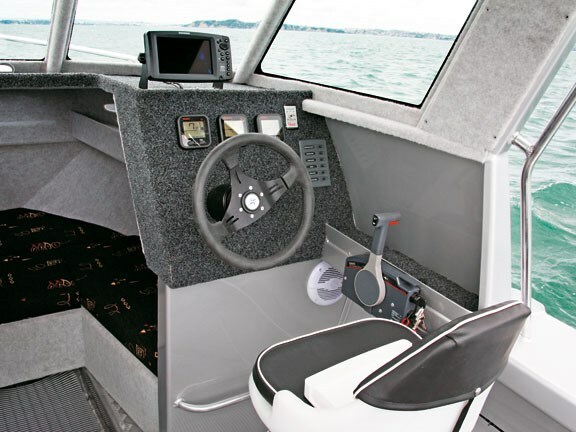 The broad gunwales, set at a secure thigh-height, also provide a comfortable seat while fishing. 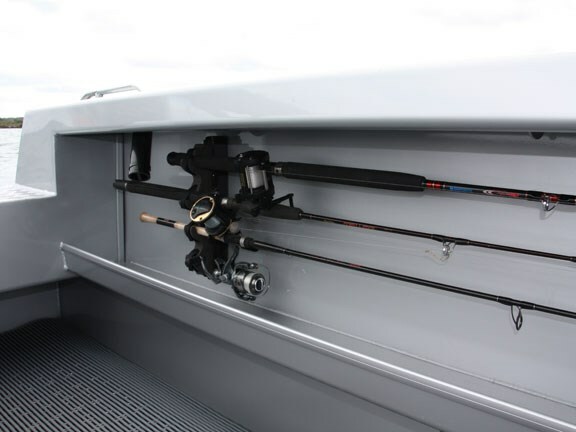 Numerous rod holders are set into the gunwales and transom, while the entire topside of the boat is painted in a hard-wearing two-pack paint that is both eye-catching and practical. The broad beam of 2.35m keeps the boat legal for towing while maximising the interior space available. The hull is built out of 5mm plate, while the sides are 4mm. Topsides and hard top are 3mm to keep the weight down, and Langdale estimates the total hull weight to be somewhere around 790kg. All-up weight with the 150hp motor and a full tank is estimated at about 1500kg, well within towable limits of the unbraked tandem Voyager trailer that is supplied with the package. Up front, a welded alloy bow rail, bow sprit and bollard are standard, while the optional "Quick" combined rope and chain windlass is fitted. A large tinted hatch provides access to the bow area, although there is also easy access around the outside of the cabin. 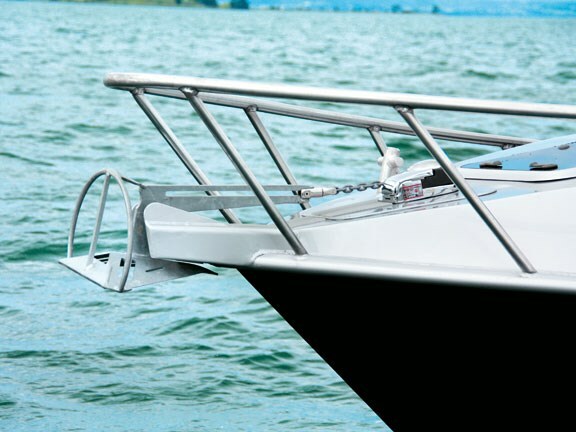 The hardtop design provides in excess of 6ft of headroom, a common shortcoming of many boats. The forward cabin has two slightly over-length upholstered bunks of 2m, again ensuring that those of lanky disposition will not complain about space. The cloth-upholstered squabs lift up to gain access to dry storage areas either side, while provision has been made for fitting a toilet under the centre squab. The floor inside the cabin has been lowered to provide better headroom, and the cabin doorway features a cut-away to enable someone to stand fully upright in the cabin area. 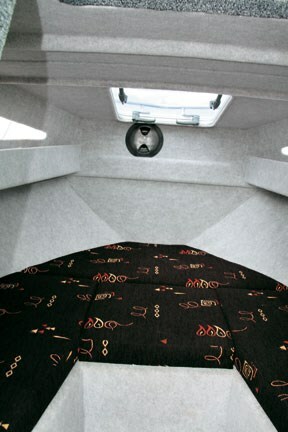 The interior of the cabin, the dashboard and the inside of the hardtop area are carpet-lined to provide warmth and noise dampening. The helm and passenger seats are pedestal-mounted molded plastic seats with comfortable vinyl squabs. The dash layout in the test boat is dominated by the electronic gauges for the Yamaha, but if these were moved to the side, a chartplotter/sounder could easily be fitted into the dash. On this boat the excellent Humminbird 957 combo sounder/chartplotter is fitted on a bracket just behind the dash. A GME VHF radio and a Boss stereo unit are mounted well out of the way in the ceiling. The cockpit features a treadplate floor that covers two sealed and pressure-tested buoyancy chambers. An under-floor fuel tank of 120 litres is fitted in the centre space and provides a working range of well over 200km, depending on speed and conditions. A larger capacity tank is also available. A "rocket launcher" rod holder is welded to the rear edge of the hardtop, and an easily-cleaned rubber tube mat covers the whole cockpit floor. This is a very fisherman-friendly boat, with a single large parcel shelf running down the full length of either gunwale, fitted low enough to allow the fitting of nylon rod brackets that lift the rods off the shelf and keep them from bumping around. The shelves are big enough to accommodate even large items like a tackle bag, keeping everything off the floor and out of the way. An optional bait board with drain hose is fitted to the central rod holder at the rear; a further option is a fitted live bait tank with aerator pump. 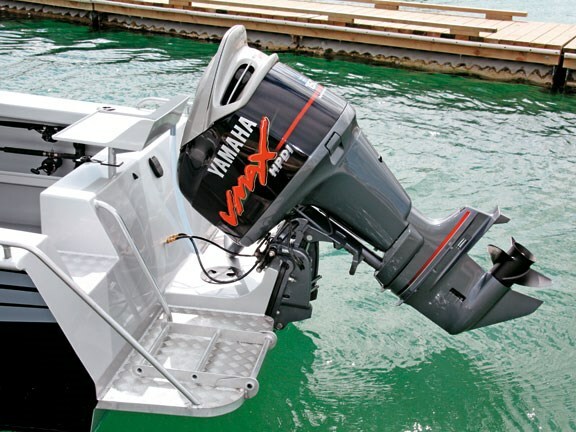 Hanging off the back of the boat is a 150hp Yamaha V Max HPDI engine. 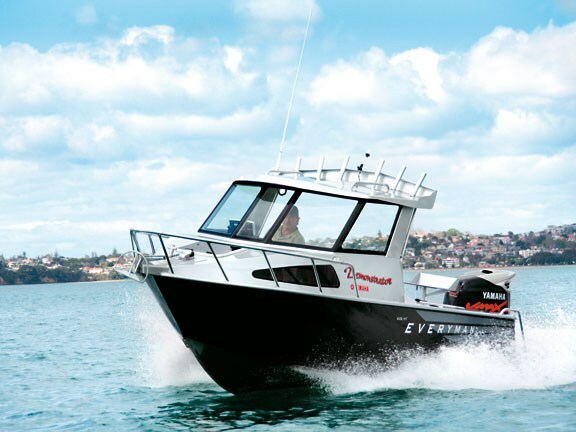 The hull has a recommended engine rating of 115hp to 150hp, so this is clearly one of the top end options. Viewed from the front, the hull is dominated by the very high sheer sides, a chine that must be the widest on the market, and a relatively shallow 15 degree deadrise. With no planning strakes, this geometry looks quite different to most alloy designs, and the proof of the pudding is the Everyman’s performance on the water. Launching from Westhaven on a sunny spring day, we headed out towards Rangitoto. Conditions were fine, with a light westerly breeze and a chop of about half a metre. The dryness of the hull was immediately obvious, the huge chines turning the spray well away from the boat so the windscreen and cockpit remained completely dry. One thing obviously apparent is how quiet the 635 HT is. Most ‘tinnies’ sound just like their nickname, which is to say they rattle and bang when going over a short chop. The absence of planning strakes, plus the fact that at speed the chine is well clear of the water, makes this into what must be the quietest alloy boat I have ever experienced. Clearly the hull is also solidly built, with structural integrity to ensure nothing flexes and rattles where it shouldn’t. The hydraulic steering is a pleasure to use, light and positive. We did our best in the conditions to get the boat airborne, but despite the relatively shallow "V" of the hull, it preferred to slice through the waves rather than lift off them. When we did manage to get some air the landings were all relatively light, with none of the usual crash and bash of an alloy boat. Even at full throttle the Yamaha HPDI is very quiet, with almost no vibration discernible in the boat. The responsiveness and power of the Yamaha is staggering, and although we were in medium trim (full fuel tank with two adults on board), it had power to spare. We never reached top speed but Spiers says the boat with this motor has been tested in excess of 42 knots. Although this indicates that a smaller motor around the 115hp mark would still be perfectly adequate, this boat never felt over-powered. We played with a range of trim settings, went through smooth and choppy water and jumped several large wakes and waves. At no point did the boat feel even remotely ‘dangerous’, and there was absolutely no evidence of the porpoising that sometimes afflicts over-powered boats. The 635 HT also has an interesting performance feature that will appeal to the boy-racers out on the water, in that it can perform very tight turns at speed. Thanks to the wide chine that ‘bites’ in a hard turn, the boat turns on the proverbial dime. This ability could also be a lifesaver for those who regularly launch through west coast river mouths, where the bar can develop huge waves that need to be taken head-on. The tight turns and responsiveness of the motor allow this boat to be spun around in between sets, a comforting thought if you don’t quite get it right the first time. In this reviewer’s opinion, this is the best aluminium hull I have tested. Although the whole package is a no-frills fishing machine, the smooth silent ride will satisfy the most discerning buyer. This boat blurs the edges between the traditional ruggedness of alloy hulls and the quiet smoothness of fibreglass. For more details, to arrange a demo or to find a dealer near you, contact Russell Spiers on 027 492 7079. 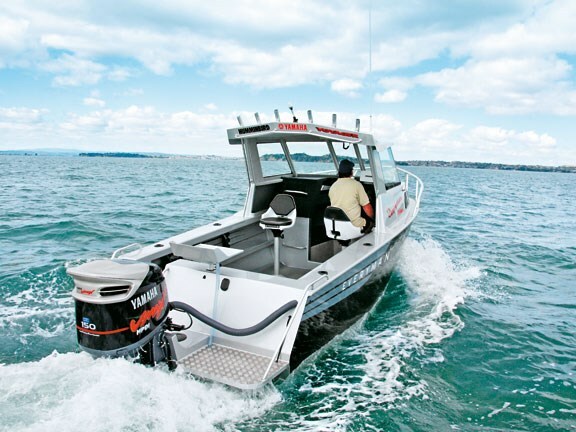 Packages are available from $54,500 with a 115hp Yamaha Saltwater series motor, and the price of the model tested is $82,000, including the electronics and all accessories.